The band culled their name from the Variety Slanguage Dictionary, a glossary of Variety’s frequently-used slang, which was provided by the Hollywood Insider publication to help not-so-savvy readers decipher its content. The magazine used the term to refer to drive-in theatres, because of their privacy and romantic allure for teenagers. 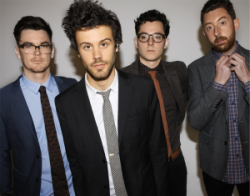 The first Passion Pit songs, which would later become the Chunk of Change EP, were written by Angelakos at Emerson College as a belated Valentine’s Day gift to his then-girlfriend. At first, he wrote and performed all his material alone using a laptop. After one of his solo shows in the Boston area, Ian Hultquist, who was attending Berklee at the time, approached Angelakos and expressed interest in creating and playing music collaboratively. They formed a group that consisted of Angelakos, Hultquist, Ayad Al Adhamy, Thom Plasse (bass), and Adam Lavinsky (drums). The band spent a considerable amount of time trying to flesh out a collaborative format and structure that would work best for them. Jeff Apruzzese and Nate Donmoyer joined the band shortly after they signed to Frenchkiss in 2008, replacing Plasse and Lavinsky, respectively. In 2012, Adhamy was replaced by Xander Singh.